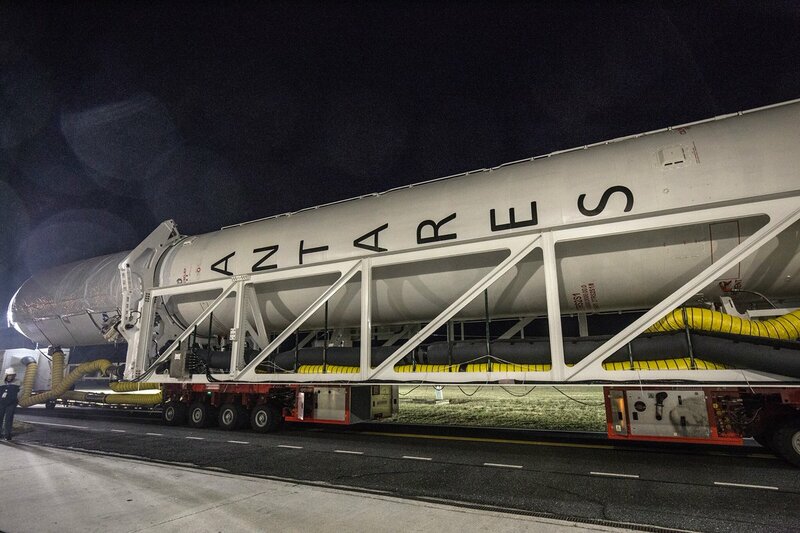 The two-stage Antares launcher, assembled and operated by Orbital ATK, emerged from its horizontal integration building at NASA’s Wallops Flight Facility in the predawn hours Thursday. 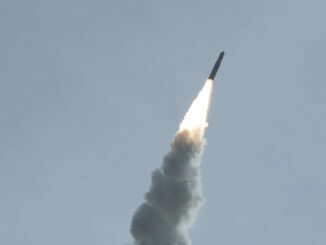 A self-propelled transporter carried the rocket on a mile-long trip south to launch pad 0A, a complex owned by the Virginia Commercial Space Flight Authority, a state agency chartered to attract commercial space business to the region. The rocket rolled out in steady rain at the spaceport, and the Antares second stage and payload shroud were protected by a weather shield for the approximately two-hour transfer. Ground crews engaged hydraulic cylinders to lift the 139-foot-tall (42.5-meter) rocket vertical at pad 0A later Thursday. Technicians then began connecting propellant and other fluid lines between the launch pad and the Antares booster. Orbital ATK’s automated Cygnus spaceship, christened the S.S. Gene Cernan after the late moonwalker, is fastened on top of the Antares rocket with approximately 7,385 pounds (3,350 kilograms) of cargo and supplies for the space station and its six-person crew. There is a 95 percent chance of favorable weather for Saturday’s launch attempt, and officials said sub-freezing temperatures expected overnight before launch should not be a problem. Temperatures are forecast to be between 25 and 30 degrees Fahrenheit at launch time Saturday, above the 20-degree limit for an Antares launch. 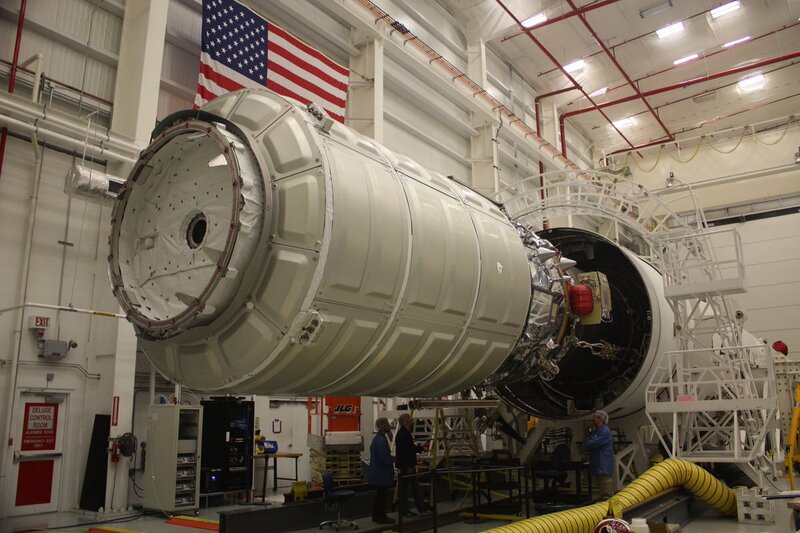 Climate-controlled air routed through ducts leading into the Antares rocket will ensure the Cygnus spacecraft, its engines and avionics remain within acceptable temperature and humidity constraints. Three environmental control umbilicals will blow air into the Antares payload fairing, the intertank section between the first stage’s liquid oxygen and kerosene tanks, and into the booster’s aft bay. “Those three volumes, we keep them nice and cozy in cold weather, and we keep them cool in hot weather, and that enables us to launch in a variety of conditions,” said Kurt Eberly, Orbital ATK’s Antares program manager, in a Facebook Live event Thursday previewing the flight. 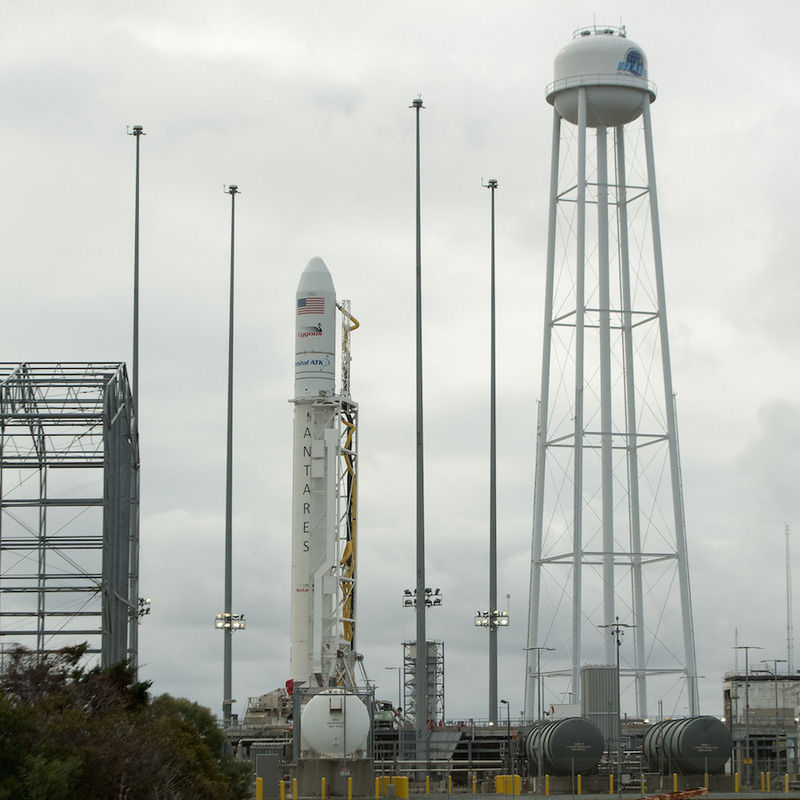 The launch team will load around 41,000 gallons (155,000 liters) of liquid oxygen and 21,000 gallons (79,000 liters) of rocket-grade kerosene into the Antares first stage beginning around 1 hour, 35 minutes before liftoff. Saturday’s blastoff will be the eighth time Orbital ATK has launched a resupply mission to the space station. Orbital ATK has used its own Antares rocket launched from Virginia four times — with one launch failure in 2014 — and contracted with United Launch Alliance for three Atlas 5 flights from Cape Canaveral. Liftoff of the commercial resupply mission, named OA-8, scheduled for 7:37:25 a.m. EST (1237:25 GMT) Saturday to begin the Antares rocket’s seven-minute climb into orbit, kicking off its pursuit of the space station. There’s a five-minute launch window available Saturday. Two kerosene-fueled RD-181 engines, made in Russia and derived from engines used on Zenit and Atlas 5 rockets, will power the Antares’ Ukrainian-built first stage booster, combining to generate around 864,000 pounds of thrust. Shutdown of the RD-181 engines is planned for T+plus 3 minutes, 34 seconds, followed by first stage separation around six seconds later. The launch Saturday will be the second Antares mission using RD-181 engines, which Orbital ATK ordered from the Russian engine-builder NPO Energomash to replace decades-old Russian-built AJ26 engines blamed for an Antares rocket crash seconds after liftoff in October 2014. The RD-181 engines performed better than predicted on an Antares launch in October 2016, giving engineers confidence to loosen performance limits for the OA-8 launch. The engines produce more thrust than the AJ26s, and they will be programmed to fire around five seconds longer on Saturday’s launch than on the last Antares flight. With the higher performance, the upgraded Antares can carry approximately 300 pounds more cargo than managers initially expected. 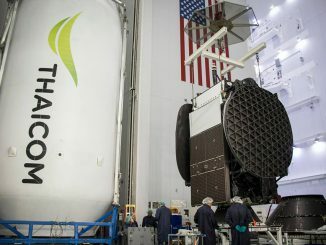 The lifting of additional conservative flight constraints, coupled with further minor changes to the vehicle, will further raise the Antares rocket’s payload capacity another 300 pounds in the coming years. Once the first stage finished its job on Saturday’s launch the Antares rocket’s payload shroud will jettison in two halves at T+plus 4 minutes, 11 seconds. The launcher’s Castor 30XL solid-fueled upper stage will ignite at T+plus 4 minutes, 23 seconds, and burn out at T+plus 7 minutes, 6 seconds, delivering the Cygnus cargo ship to an elliptical orbit less than 200 miles (300 kilometers) above Earth. Deployment of the Cygnus supply carrier is set for T+plus 9 minutes, 3 seconds. The spacecraft’s two cymbal-shaped electricity-generating solar arrays will unfurl in a fan-like motion around 90 minutes into the mission, and the ship’s thrusters will begin fine-tuning its approach to the space station with a series of course-correction burns Saturday and Sunday. The Cygnus spacecraft will make a laser-guided final approach to the orbiting research lab Monday, closing to a distance of around 30 feet (10 meters) from the station. European Space Agency astronaut Paolo Nespoli, assisted by station commander Randy Bresnik, will take control of the lab’s Canadian-built robotic arm to capture the Cygnus. 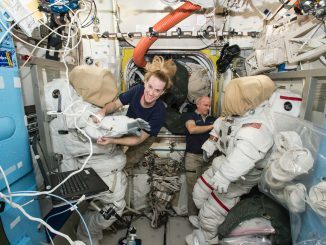 The arm will attach it to a port on the station’s Unity module, where it will stay until around Dec. 4. Astronauts will unpack experiments and supplies hauled inside the Cygnus’ pressurized module, made by Thales Alenia Space in Italy, then load it with trash and other items marked for disposal. Payloads slated for delivery to the station on the OA-8 mission include food, clothing and a multitude of research experiments. The Cygnus spacecraft will raise its orbit to around 300 miles (500 kilometers) after departing the station in early December to release a slew of commercial and NASA-developed CubeSats, then the ship will brake out of orbit with the help of thrusters for a destructive re-entry over the South Pacific Ocean.